Well hello there. Just wanted to let everyone know that I'm working on updating my sweater mesh. You know, to fix the UV overlapping problems. The only bad thing is that it will break all recolors. So when I upload it, and you've made recolors or have recolors of the mesh, you're going to have to update them. I'm sorry. Also, I know a lot of you are wanting my swimtrunks for teans. I have them, I just need to get them uploaded. I just don't know when, sorry. Let's just say things didn't work out with Tyler and Daisie and I are both going to be at Kiki's site now. So, for anyone interested, those conversions I did of some TSS teen meshes? 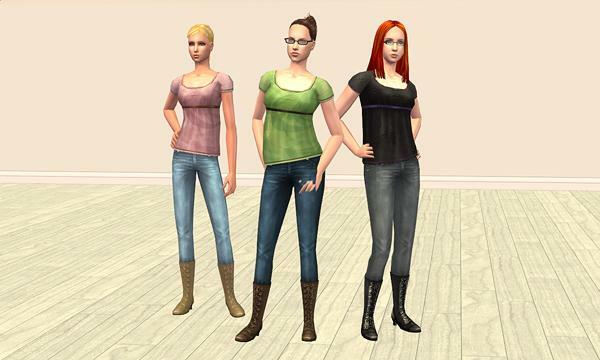 They are now available at Kiki's wonderful site, Phasmatic Sims. Coming soon to a WNF site near you. . . So, not too thrilled with some of the conversions of teen clothing lately, I've been converting them myself. I've done some from Free Time, but now I'm starting Teen Style Stuff. I wanted to show a preview here, but it's not going to be uploaded here. I've really started to branch out where I upload my items, so these are going to be on the wonderful Kiki's website, Phasmatic Sims. All outfits have a working fit and fat morph. The first and second also have working preg morphs as well.